Beer lovers of the world, unite. No matter if you’re an IPA fan, a stout-stan, or ale advocate, the first ingredient of beer is water. So it’s especially important that we get that first ingredient right. The Alliance is dedicated to protecting and restoring the water of the Great Lakes. We’ve rounded up some of our favorite breweries that use Great Lakes water in their beers and support our work for clean water (which leads to better beer). If a group of fish is called a school, and there’s all this #TwoHearted… can we go back to school? This Michigan brewery has been selling its beer since 1985. With two locations in Kalamazoo and Comstock, Bell’s is not far from the coast of Lake Michigan. 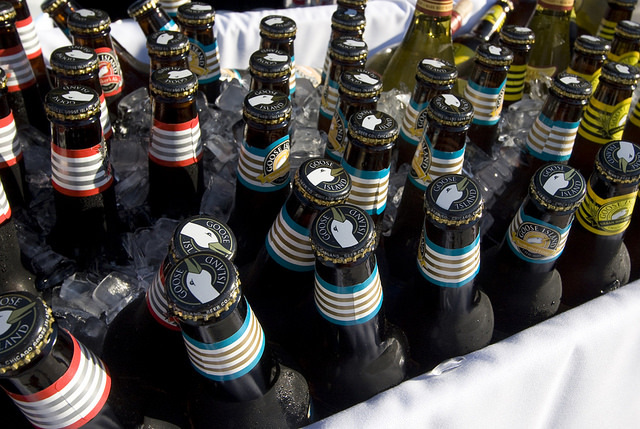 If you attend our Great Blue Benefit, you’ll spot lots of our sponsor Bell’s Brewery beer that they kindly donate for a fun night. Another brewery near Lake Michigan, Goose Island got its start in 1988. They have a commitment to sustainability and “damn fine beer.” Over the years, Goose Island has sponsored Adopt-a-Beach events and held post-clean up celebrations. Their main brewery is located in Chicago, Illinois. You might recognize this name from their popular Brewers Rock fundraiser that has benefited the Alliance the past two years. Kinslahger is located in Oak Park, Illinois and opened in 2016. It is focused on lagers, fellowship, and sustainability. This Cleveland, Ohio brewery has been making tasty drinks since 1988. Not only do they brew good beer, they also focus on brewing good and support our Adopt-a-Beach program and hosted our Clean Lake Benefit in Cleveland, Ohio. Started in 1997, this Grand Rapids, Michigan Brewing Company is loved for its IPAs, made with crisp and cold water from the Great Lakes region. Their passion extends beyond beer, though. Founders is committed to reducing its environmental footprint and supporting causes including the environment and protecting clean Great Lakes water. Past support of the Alliance has included a special fundraiser held last year in collaboration with Hopleaf Bar in Chicago. If you are a business interested in partnering with the Alliance for the Great Lakes, please contact Megan Hilbrich, Institutional Giving Manager, at 312.445.9758 or mhilbrich@greatlakes.org. No matter what beer you like, we can all agree on the need for clean and safe water. Tap into the latest Great Lakes news with our emails.